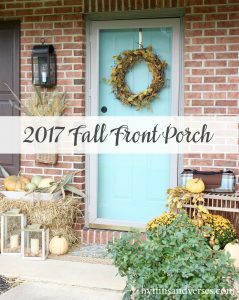 Welcome to my 2017 Fall Home Tour! I’m so glad you are here today! Thanks so much to Marty of A Stroll Thru Life for organizing this week long tour of fall blogger homes. If you are here visiting from Jenna’s, Rain on a Tin Roof, welcome! If you are new here, I just purchased this vintage sofa from Craigslist. 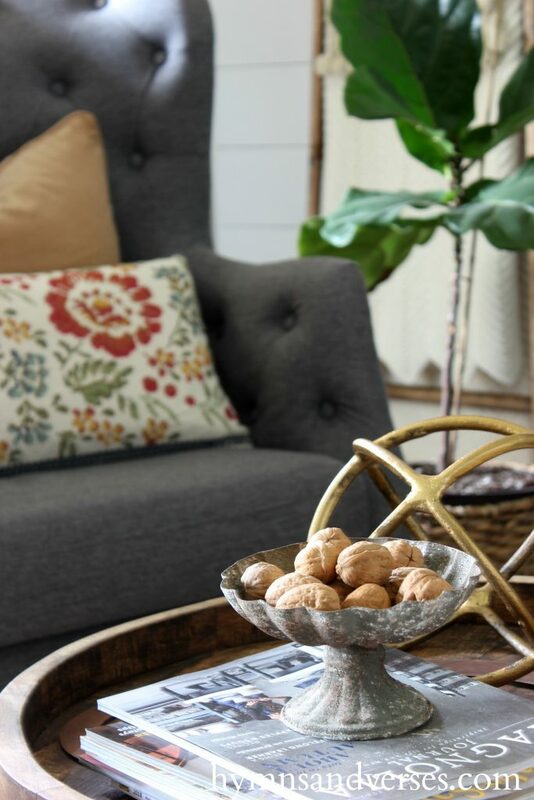 I had to adjust my fall decor a bit to try to make this tobacco color velvet work with my mainly neutral decor! The sofa will be getting a makeover soon, but the color right now is kinda of perfect for fall! I created a leaf gallery wall using amazing leaf photography that you can find HERE. I chose some of the leaves, printed them out on cardstock, and hung them on the wall behind the sofa with washi tape. I got this idea from an old issue of Country Living Magazine. I found these candlesticks at one of my favorite local shops and just added some antique books to complete the look. I found the wood leaf garland at HomeGoods. For fall, I used accessories with warmer, fall colors. 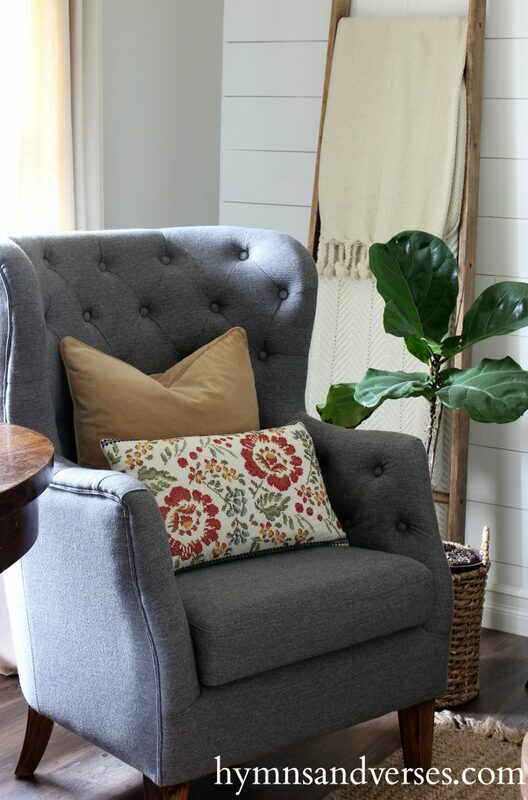 Using accessories with a little fall color can really warm up a more neutral room. The pillows shown here are from HomeGoods. 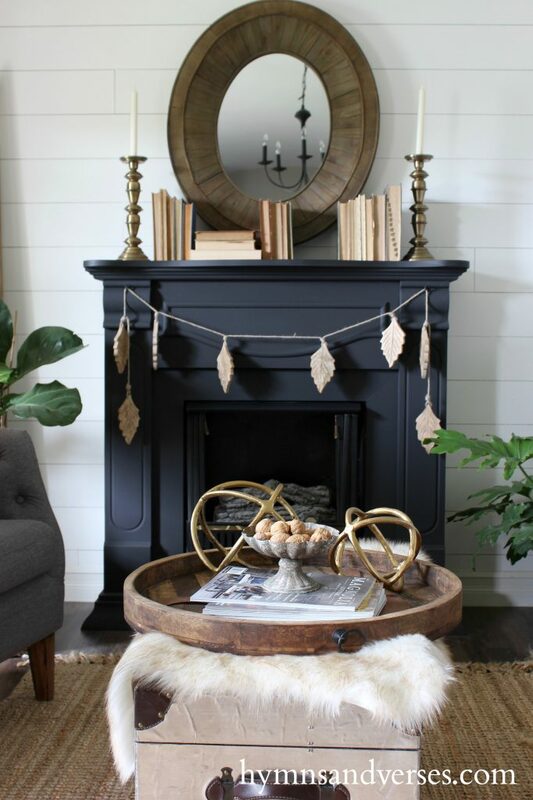 Elements like wood and brass lend themselves to the fall season. I’ve been making quite a few trips to the farmer’s market gathering up pumpkins, gourds, etc., for my fall tours. I couldn’t resist these amazing sunflowers. I am always tempted by all the fall decor in the stores, but I try to keep my purchases to a minimum and always think about how many seasons I may use something. I try not to buy trendy items. 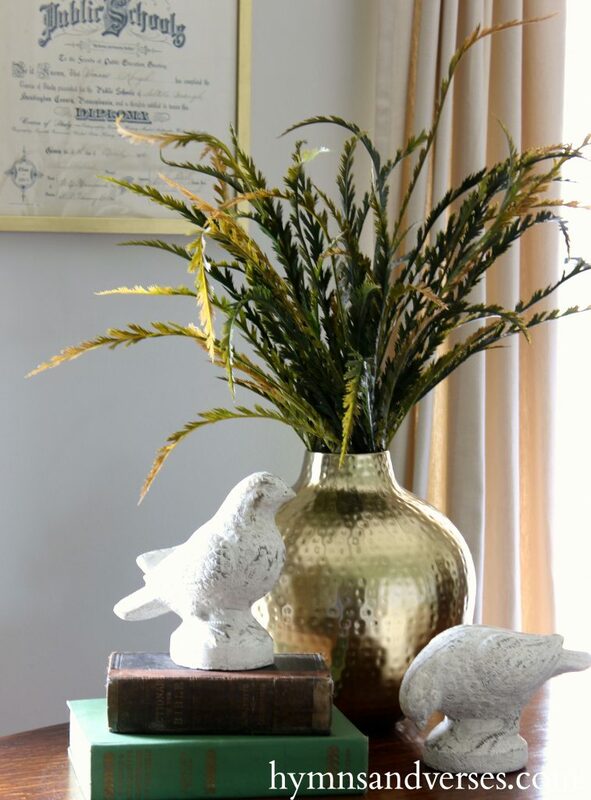 But, I do love these gold mercury glass pumpkins and just couldn’t resist them. I think mercury glass is pretty classic. I continued the use of warm tones into the dining room and kitchen areas. 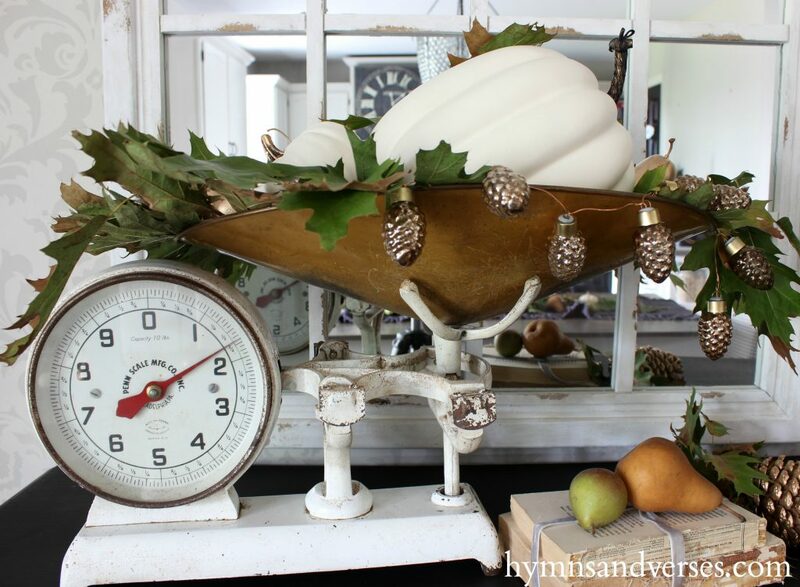 My vintage scale is loaded with fall leaves, white pumpkins, and golden pears. Those mini mercury glass pinecones light up! They are gorgeous at nighttime! Again, I found them at HomeGoods for about $7! 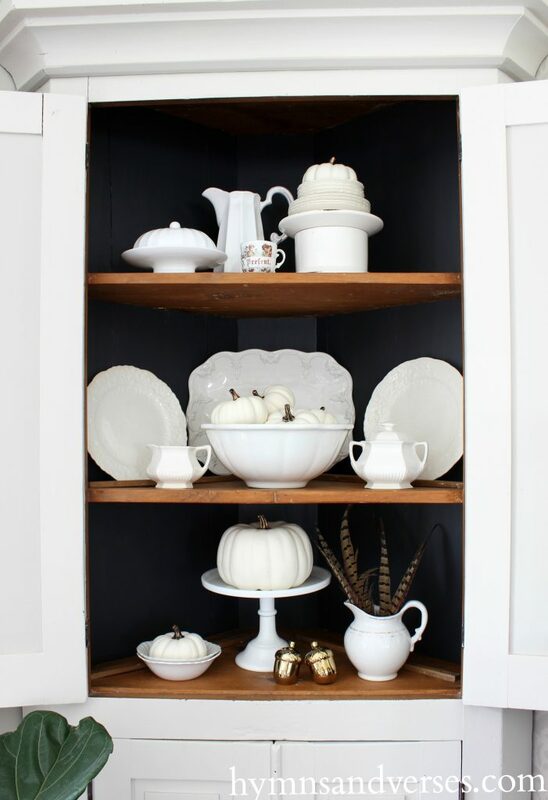 I painted the back inside walls of my corner cabinet black and love the new bold look – especially with my white dishes and pumpkins! 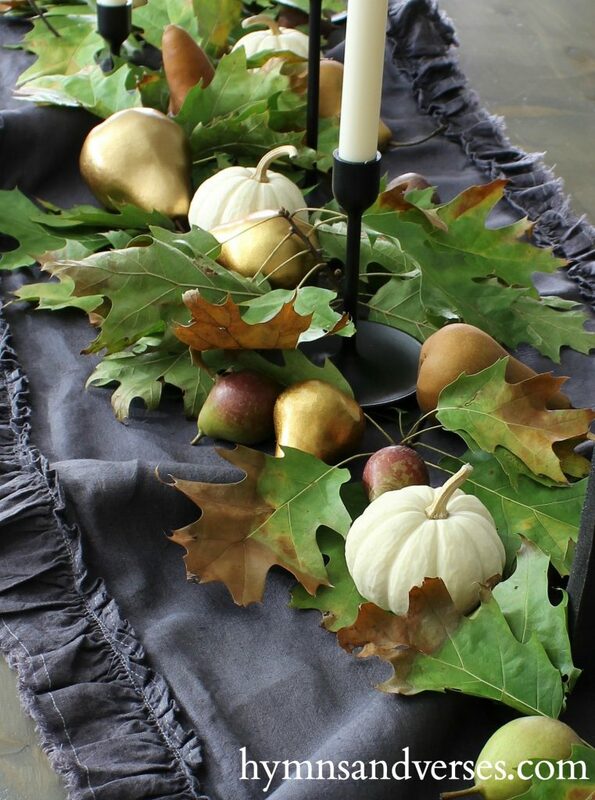 On my table I used a dark gray linen runner with varying sizes of tapers and a collection of fall leaves, baby boo pumpkins, Bosc pears, and gold painted faux pears. 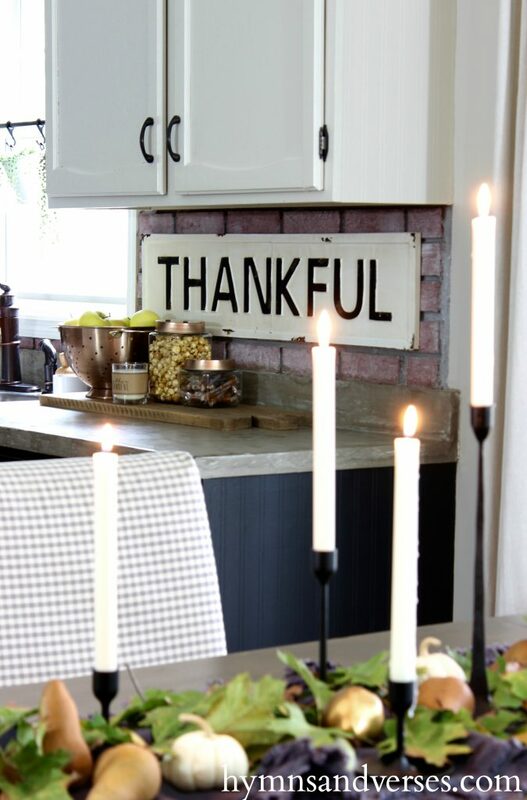 This amazing tin Thankful sign was another find from one of my favorite local shops! Do you see those little mini pears! I found them at the grocery store! They’re called Seckel Pears! They are super sweet and bite sized and are sometimes referred to as sugar pears! Thanks so much for stopping by to see my 2017 fall home tour! 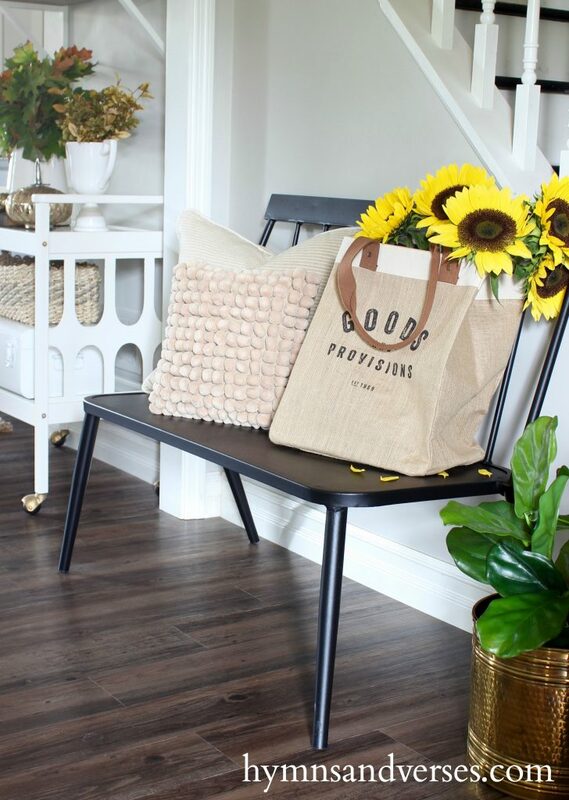 I hope you had a chance to visit the other blogger homes on today’s tour! Up next is Z Design at Home. The links are below for your convenience. Tomorrow’s first stop is Far Above Rubies. 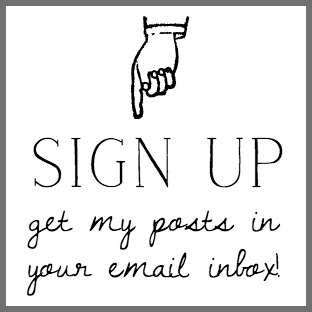 I’d love for you to sign up to get my posts in your inbox! 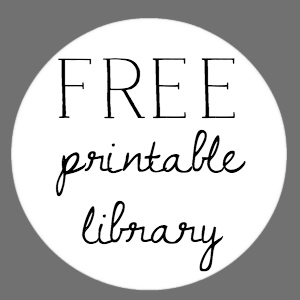 Just click the box below to get your free downloadable print when you sign up! Oh my goodness. I love to come to your home. It is like opening a present that you know you’ll find lots of goodies. You’ve really outdone yourself. Enjoy the season. This is all so stunning!!! Ugh! Can I move in!! Haha all the tomes and colors are perfect! 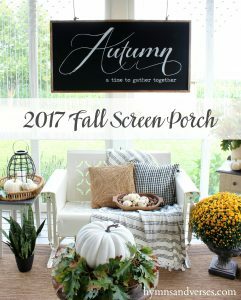 My favorite fall home tour I have ever seen! I love everything that you’ve done. Your home is a “real” home, it’s a combination of lovely old pieces, natural pieces with just a little bit of new thrown in. 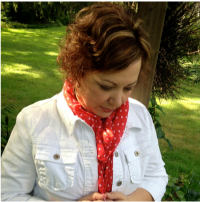 Many of the blogs I visit look like a Pottery Barn or Country Door catalogs. This doesn’t impress me. I like seeing what can be done with a bit of work, imagination and without spending paycheck after paycheck to “get the picture”. Thank you for being “Real” and doing so well at it. Gorgeous. 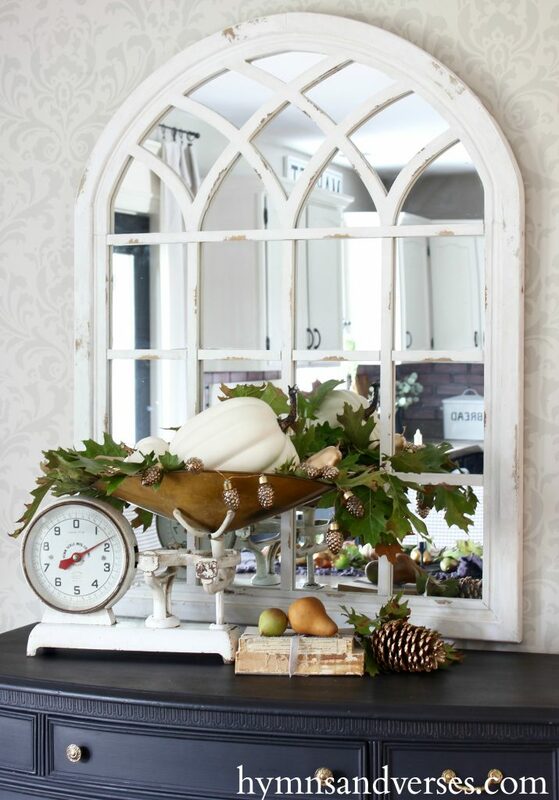 I love how you have added just the perfect fall touches to your home. That scale is amazing and I love the simple center display on your table. Beautiful tour. Thanks so much for joining the tours. As usual you have such a beautiful tour. 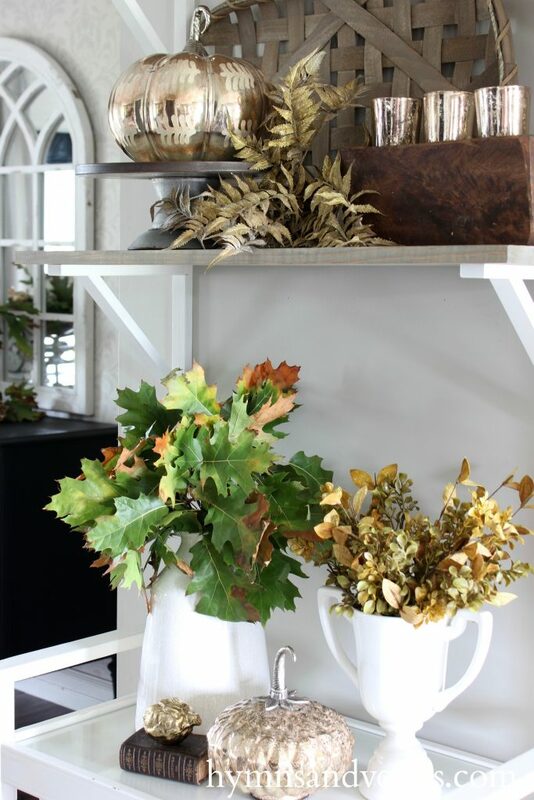 I love the touches of fall, especially the pretty simplicity of your table runner with leaves. Happy Fall. Doreen, what a beautiful fall home tour. I love the sofa from Craig’s List.,,how perfect for autumn! Doreen that couch! The gray runner! The scale! So much fall glory and goodness. Bravo! LOVE—LOVE!!!!!!!!!!!!!!!!!!!!! Your decor———-you are amazing!!!!!! My kind of design!!!!!!!!!!!!!!!!!!!!!!!!!!! Love your home, Doreen. 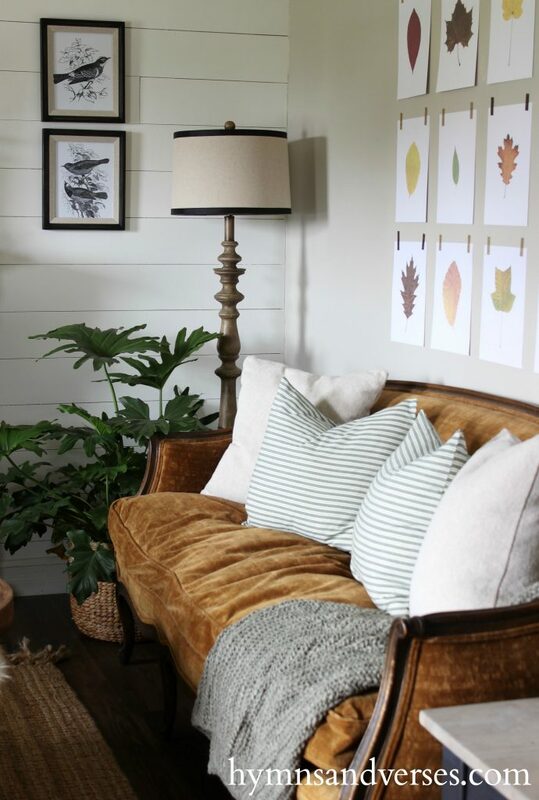 That sofa is amazing, you’re right, that tobacco color is perfect for a Fall backdrop! Your home looks beautiful, Doreen! I really enjoyed your tour! 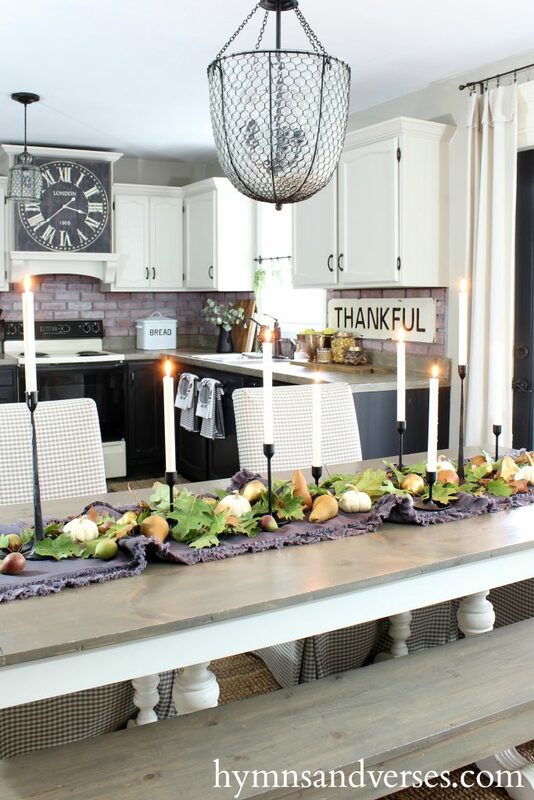 The tablescape is wonderful…and my favorite…your whimsical wall of leaves! Thanks for sharing! I love the thankful sign. I like seeing people do seasonal decor but at my age I never change except for Christmas. I always enjoy your tours! Your home really speaks to me. I love the color on that sofa! I know you said you were changing it, but it looks so rich. I love all of the gold touches. The china hutch looks great too. Do you remember where you got those fall looking ferns on your shelf? Beautiful! Every tour season time, I look forward to your decor Doreen, you know why? Because you never disappoint to surprise us all! You are just a decorating genius! 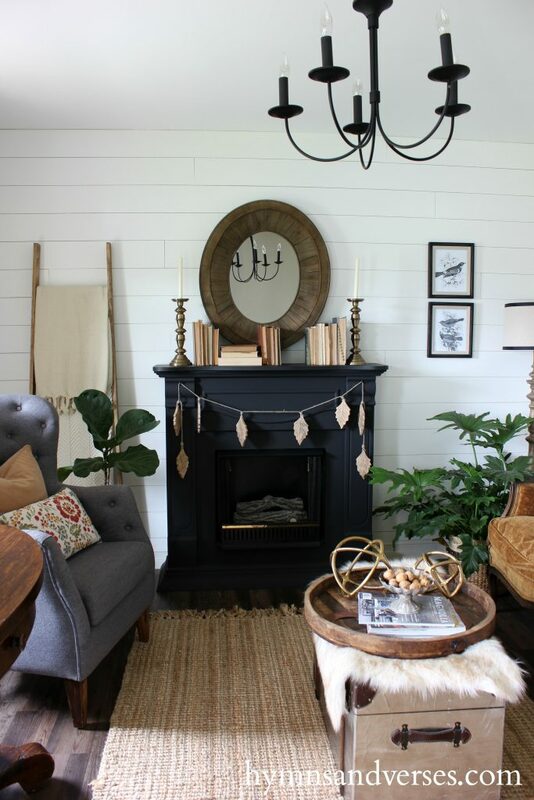 I love everything of course but adore the leaf wall art you came up with and you make me wanna buy black candlesticks right now! As always, so honored to share this home tour with you! Cheers! It’s all beautiful. Your tablescape is so stylish. Would you be willing to share the source for your black candlesticks? I look forward to all your seasonal home tours. I am wowed!!!! This totally surprised me!!!! Love all the details. I’m glad I have the iPad to easily view the details. The lights and candles add so much. I like how this ties to the living room too! Just a look of beauty to behold. So pretty! 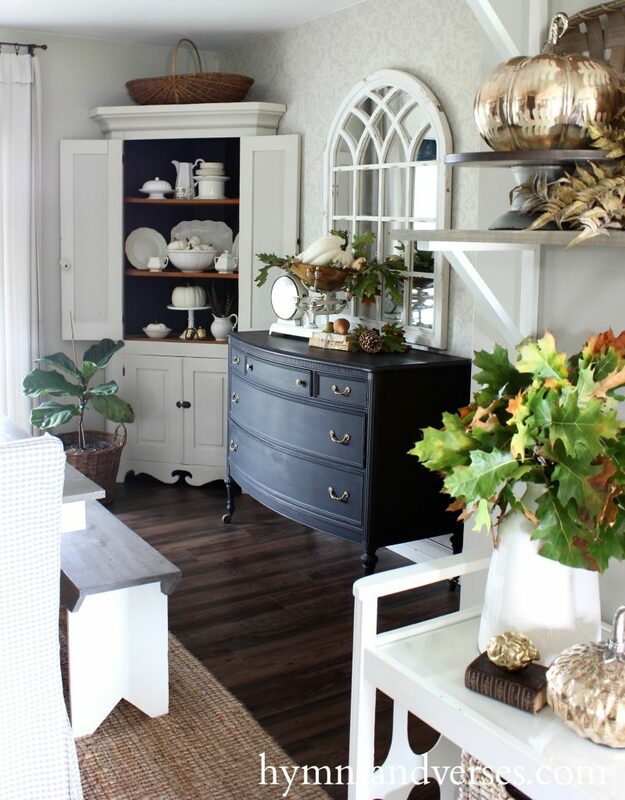 Can you tell me the color of the blue chest/ dresser in your Dinning room? It is the color I am looking for! Doreen- how amazing is your sofa find. its such a beautiful color, fall or not. I also love that leaf wall. your home is always such a treat to visit. Hope all is well with you. 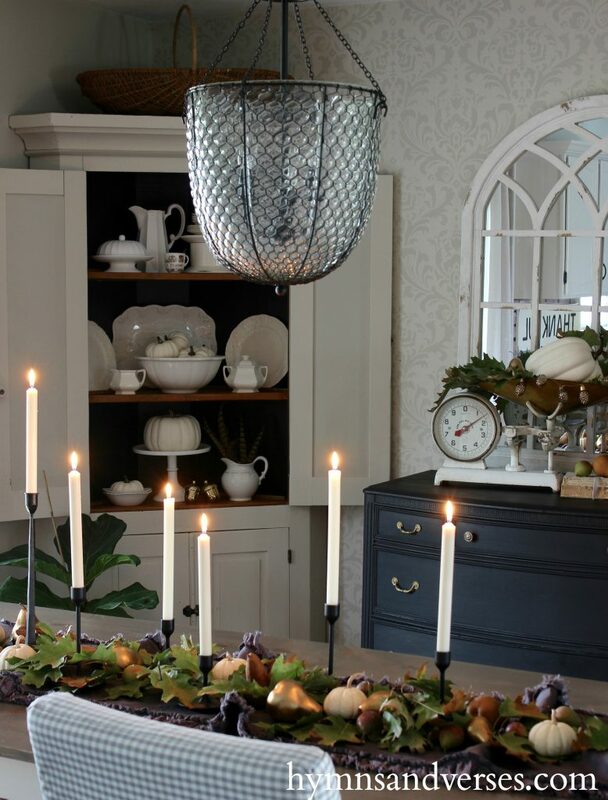 Love all of those natural elements that make everything look so welcoming and festive at the same time. Seriously beautiful! 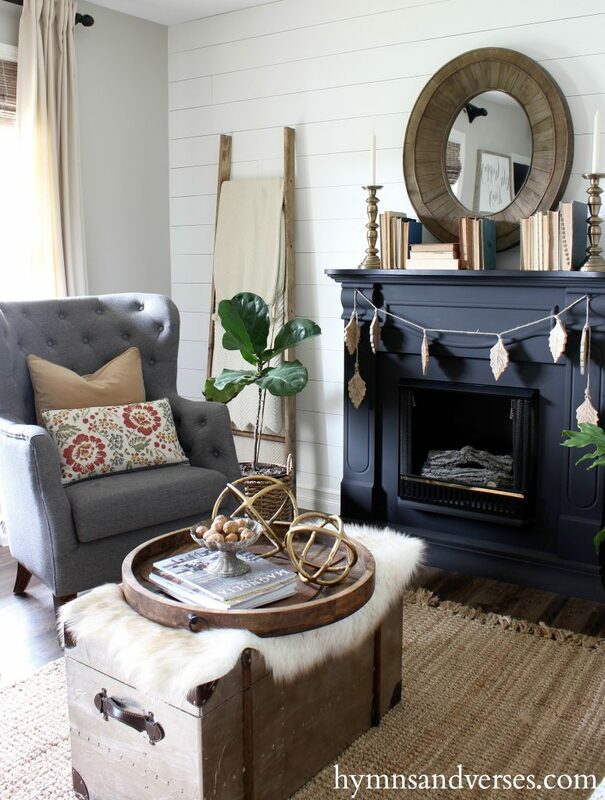 Autumn is such a good season for homes and your home looks gorgeous!! I love all your décor and vignettes. Your house is also warm, cozy and inviting. Were the links only good for a short amount of time? None of the links above are working. Hi, Lori. I’m not sure what happened, but I’ve fixed the links now and they all work! Your home looks really beautiful and stylish. 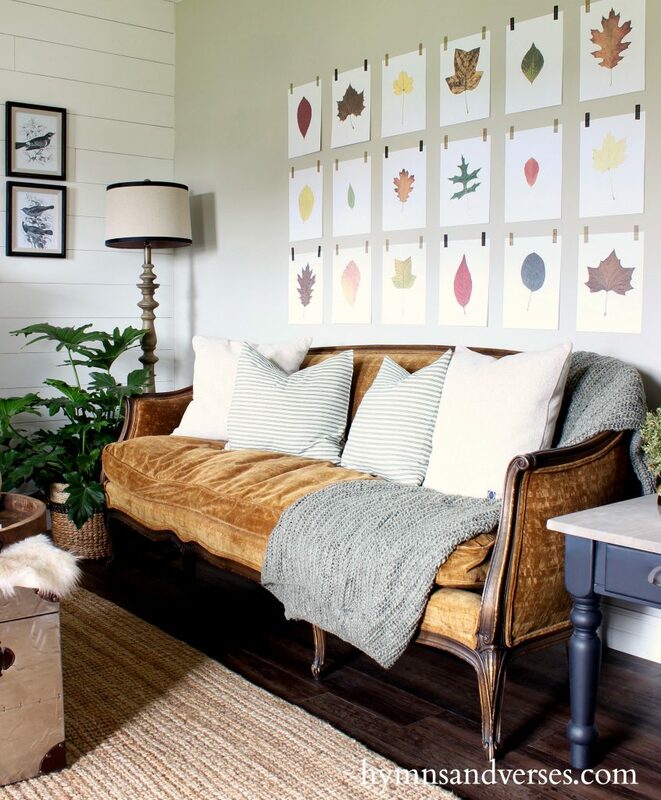 I love the style and the colours and the decoration with the leaves behind the couch is adorable!